(2) Free download of the complete issue as a .pdf including editorials, content lists, and a back page briefing: Scottish Justice Matters 2:3 The Living it: children, young people and justice issue. This issue’s focus on the lived perspectives of children, young people and criminal justice, has been guest edited by Claire Lightowler of the Centre for Youth and Criminal Justice, University of Strathclyde, Brian Rogers and Susie Cameron. Youth Advantage Outreach Susie Cameron writes about how it feels to work with Youth Advantage Outreach. “Conducted by the Army’s Recruiting Group alongside Police Scotland and other agencies, the five day residential courses provide diversionary activities for young people aged 14-17 who are on the cusp of crime, disadvantaged, disaffected or disengaged from society”. Time to Change. Aimie Robertson writes about her childhood experience of having a brother in prison. “My brother was sentenced when I was only 12 years old, and at the time, I couldn’t imagine anything more shameful or shocking”. Growing up is hard to do. Nina Vaswani explores the links between childhood trauma and offending. 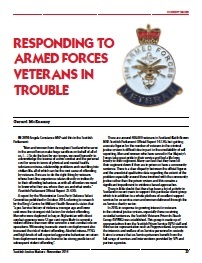 “My own research with 33 young men in HM YOI Polmont found that 91% of these young men had been bereaved, and many had suffered traumatic and multiple losses”. Cyberbullying. 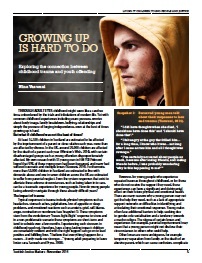 Helen Cowie looks at the impact on young people. “Face to face bullying is a well-known risk factor for the well-being of children and young people. The recent emergence of cyberbullying indicates that perpetrators have turned their attention to technology as a powerful means of exerting their power and control over others”. 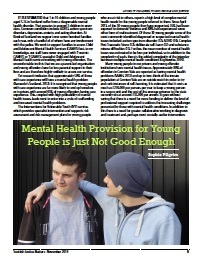 Two of our guest editors, interviewed two 16 year old boys from Glasgow about their experiences of cyber-bullying. “The boys felt that adults didn’t understand the scale or significance of the issue”. In his concluding comments Brian Donnelly stresses that cyberbullying is about relationships, not technology. “The behaviour appears to be migrating, as children spend more time online, the behaviour they have always exhibited and experienced comes with them”. Who’s got your back? 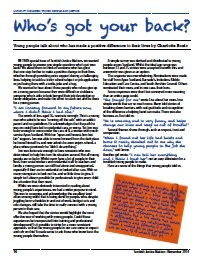 Charlotte Bozic surveyed young people about who’d made a positive difference to their lives, and this is what they told her. Follow Scottish Justice Matters’s board ‘Living it’: children, young people and justice on Pinterest. In the next issue (March 2015), Anna considers the evidence for child prostitution in Victorian Glasgow. Understanding Diversity. A service user interviewed Shoket Aksi of Glasgow’s Youth Community Support Agency about working with black and minority ethnic young people in the justice system. Take 5. We asked influential MSPs “In a recent lecture, Professor Lesley Mcara said that it was a ‘national disgrace’ that the age of criminal responsibility in Scotland is still 8 years old. What is your view?”. This is their response. Briege Nugent reviews The Panopticon by Jenni Fagan. ” . . . Fagan has constructed a compelling story about a young woman in care who doesn’t know who she is or where she is going . . .”. 4 Pings/Trackbacks for "Living it: children, young people, justice: November 2014"